The Temeke Primary School in Tanzania got access to clean water by funds raised at the Walk for Water in 2010. Portland Global Initiatives is a registered nonprofit organization with a mission to raise awareness about the global water crisis. Over 1 billion people don’t have access to clean, safe drinking water- almost none of them reside in the U.S. Continuing population growth and urbanization, rapid industrialization, and expanding intensifying food production are all putting pressure on water resources. This presents a global threat to human health and well-being, with both immediate and long term consequences for efforts to reduce poverty while sustaining the integrity of some of our most productive ecosystems. Many causes are driving this crisis, but it is clear that future demands for water are increasingly threatened. 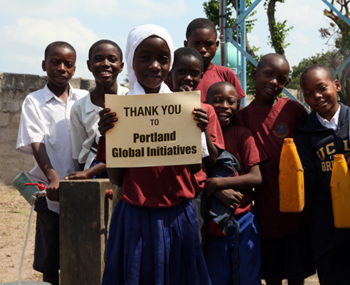 Portland Global Initiatives works to plow down barriers to water access, help support the UN Millennium Development goals and ultimately improve conditions in water-stricken areas. Portland Global Initiatives holds an annual Walk for Water each year in Portland, Oregon to raise both awareness and funds for water-related projects. Learn more about the event here or donate online at our Walk for Water page. Hi Sue, come on over to http://www.worldwaterdaypdx.com where you can register online. You can also come on Sunday, March 27 and pay then.